The year that will be….2018. Posted: 03-01-2018 | Author: kevind | Category: Business | Comments Off on The year that will be….2018. In my previous post, I reflected on the year that was 2017. Now I want to look ahead to all the wonderful opportunities that await us in 2018. Here are my top 6 predictions (top 5 is so 2017) for the African IT industry. 1. Public Cloud hyper growth: In 2017 Microsoft announced that a local datacentre will be available in 2018, AWS has already launched a Direct Connect solution in both Johannesburg and Cape Town with strong expectations of a datacentre announcement imminent. These announcements have the potential to nudge the fence sitters while simultaneously providing a clear message to resellers in the market, either you are in on this action or you will miss out. I believe the message will be heard in 2018. 2. 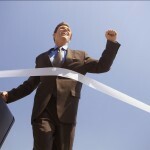 The rise of the Public Cloud MSP: Fact: Customers want to move to public cloud. Fact: They still want a partner to hold their hand and ensure success. 2018 will see many traditional MSP’s adding public cloud to their portfolio and provide this managed service regardless of the location or supplier of the service. 3. Enterprises will seek internal cloud brokerage solutions: In 2017 we saw the start of these requests coming through. The need to manage multi-clouds, global SaaS solutions, budgets, bill backs, access and governance, all from a single system has become a real need in most large organisations. This presents a great SI opportunity. 4. My DevOps team is bigger than yours: As digitisation becomes a necessary business imperative, companies have two choices, outsource or build the capability within. Many will build their own DevOps teams to tackle the “Mode 2” of the bimodal IT model. This will be the aspect that will create and maintain competitive advantage. Digitisation is no longer a nice to have, but an essential to stay in business. 5. AI and Machine Learning everywhere: As companies develop their own digital tools, both for the customer and internal use, the real value will be in what we do with the data. With the use of readily available decision-making algorithms from the likes of AWS and Microsoft, the ability to embed intelligence into these apps is becoming easier and easier for regular developers instead of AI experts. 6. Security everywhere: The more connected we are, the more personalised the services become, the more data we share. This opens up many new security vulnerabilities and these will need to be circumvented. The security opportunity is massive, it’s huge, it’s gonna be fantastic! So we are in for a fantastic IT ride in 2018 and of course, it’s all in the cloud so make sure you are in it. Happy New Year and see you in the clouds! The end of the year is always a great time for reflection. A time to look back on the IT market and assess our decisions. Did we get it right or did we miss the boat entirely? These are my top 5 observations of the year. 1. Cloud is no longer a decision: 2017 witnessed the major vendors steering the reseller channel rather firmly in the direction of cloud. All resources at the vendor level were clearly realigned to this purpose. Microsoft completely restructured to achieve this aim. Oracle made the commitment to be a 100% cloud company, and most vendors realigned partner incentives and commissions to reward the move to the cloud. 2. Partners own IP is becoming key to profitability: The vendors have been singing this hymn for many a year but the reduction in margin is making this a clear reality. 3. The rise of the born in the cloud reseller: While it is not easy for traditional resellers to build a cloud practice, the barrier to entry for a new company to enter into the IT market and compete against well-established players is relatively easy. We witnessed many new partners of this type joining the ecosystem this year. 4. Public cloud soars: 2017 was a year of exponential growth in the public cloud arena. Misunderstanding and fear is dropping by the wayside, however, it seems that the pull for public cloud is still coming from the customers. Resellers were more reactive when it comes to public cloud, offering this route mainly when asked and not as the standard. 5. AI, IoT, and Blockchain were the hype terms of 2017: While there is so much development happening in this space, very few resellers are turning these technologies into offerings at the moment. Much is being said, little is being offered. This will be a space to watch in 2018. Overall if you were in the cloud space in 2017, you would be feeling very optimistic for the coming year. The groundwork is starting to pay off and the next few years ahead will see many opportunities in this space. Look out for my next post where I will look ahead to 2018 and make my top 5 predictions for 2018. The more conferences I speak at, the more I become aware of two things with respect to cloud technology. Firstly, it is still a very misunderstood area that is becoming so ubiquitous in the IT world that one cannot afford not to understand the basic concepts. Secondly, many people are embarrassed to ask questions for a fear of looking uneducated. With this in mind, I have put together a list of some great online courses and resources that will help anyone get to grips with all that is cloud. Forget about setting your 2015 New Year’s resolutions, it’s still 2014 and there is still time to further your brain power this year. Cloud Computing Specialisation Course: A $196 specialisation course that takes you from concept to planning and implementing a cloud system. The Cloud Academy has over 25 online courses teaching you all about cloud, but these are at $29 a month. Comes with tests to check your skill. And lastly, if you are just looking for some quick definitions to make you look smart at the next dinner party, then be sure to visit these glossary sites. As Technology Changes, Do You? Posted: 16-07-2013 | Author: kevind | Category: Business | Comments Off on As Technology Changes, Do You? The Internet is awash with articles discussing the rapidly changing pace of technology. If we look back on how technology impacted our lives ten years ago, we see a very different picture compared with today. Going back to an even further twenty years ago, it seems almost unbelievable to see how we have advanced in such a short space of time. So how rapid is the change? One thing for sure is that the degree or rate of change is speeding up. This indicates that major disruptive change that was expected to have occurred over a 10-year period could now happen over a 5-year period, or even faster. In 2010 Gartner predicted that Cloud Computing, Cloud/Web Platforms and the Media Tablet were 5 to 10 years away from mainstream adoption. In three short years I think we are already there. 3D Printing was positioned as a greater than 10-year period till mainstream adoption, and we are already seeing great strides and acceptance in this technology area. The reason for the acceleration in technology development is probably two fold. Firstly we have a global IT industry that continues to broaden and diversify. Forbes places Tech jobs as one of the highest growing sectors, fueled primarily by Big Data, Cloud Computing, and a growing interest in molecular computing. The second reason for the rapid change is consumer demand. The consumers hunger for faster, longer battery life, lighter, more mobility, more features etc. is driving the pressure to manufacturers of both software and hardware to continually innovate. So as long as these two market forces persist, my advice is to fasten your seat belt and prepare for an awesome journey. What do we have to look forward to? 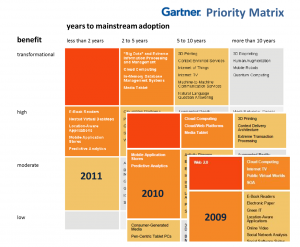 Gartner is positioning 3D Bio Printing, Human Augmentation, mobile robots, and quantum computing as the 10-year vision. We now know, we can probably expect these transformational technologies a lot sooner. The question to ask yourself is, “How do you prepare for the technology changes that are going to impact your life?” One major decision you will need to make is, what is your consumer profile? Are you an early adopter, or will you wait on the sidelines to see if a technology will be worth your time and effort to invest energy into it? Lets face it, technology change does require energy and relearning. From something as simple as purchasing a new cell phone, to working the latest Business Intelligence tools, you will need to retrain the old brain. To me the answer is simple. If you intend to be in the IT industry or want to ensure that you benefit from the latest technology, then you need to make the commitment to setting aside time to learn, and re-learn. Remember to forget what you learnt 5 years ago. That technology has moved on. For you to remain relevant in this market, view your knowledge as a depreciating asset. Unless you are adding new knowledge and skills continuously, you will be passed by, like last years cell phone model in a retail store. Go ahead and make the investment in the most valuable asset you own, yourself. Some time ago I came to realize an important fact about myself. I work better under pressure. I can have a list of tasks pages long, and perhaps weeks to do them, however, I will still be the most effective and productive at these tasks just before they need to be completed. The reason for this unfortunately is largely chemical. When we are under pressure or stress, our body releases a cascade of hormones that have the effect of heightening our awareness, getting glucose to the areas of the body that need it most and creating that ability to focus and excel at the task at hand. When we operate at our best under this sort of pressure, we experience a different type of stress. One of a more positive nature. This is typically called Eustress. Eustress is the happier cousin of distress, however the factors that determine which one you experience as a result of a particular circumstance, is dependent entirely on your outlook of the experience you are going through. If you feel you have the resources to cope with the apparent issue, both internally and externally then the situation will result in this positive type of stress. Note that I used the word “feel”. The reason for this, is your reaction is not based on the reality of the situation, but more so on your belief in your ability to handle the task at hand. Yes, it is easier said than done, and the belief really has to be internalized in order for the situation to be viewed positively. If you have been reading the above and saying “yes, this is me exactly!”, then allow me to provide a word of caution. Eustress can turn into distress at the flip of a switch. It is worthwhile examining what those situations are so you can monitor yourself and not be caught unaware. When you are used to eustress being your friend, the tendency is to take on more and more work as it always seems to work out. However, be warned that each of us has a critical point where the whole picture flips. It may be one additional task, it may be something unforeseen like an illness, however it usually is something small that makes the picture change. The result is Distress. So monitor your amount of tasks. Do not allow too many items to build up as you may land up being ineffectual with the entire lot. Each one of us has a stress capacity. Our daily actions and activities either decrease or increase our stress capacity. Activities like exercise, meditating, family time etc. build up our stress resistance and deposit stress capacity into the “bank account”. What usually happens though, is these activities provide us with the capacity to taken on more stress. As a consequence, we land up having less time to focus on these stress reducing activities. The result? We start running low on our stress resistance reserves. When we reach the bottom of the barrel, eustress can easily turn into distress. As we start a new year, I hope you are feeling that your stress resistance tank is full. Be mindful and ensure that each day you do some activity that puts back what you have taken out. If you have to go a few days without refilling, don’t get into the bad habit of not maintaining some balance. Try to have an awareness for the perfect amount of work that will stimulate you and keep you “in the zone” without overloading you and tipping the scales. Lastly, remember that stress is relative, and sometimes you just need to view it from a different angle. After all, it’s something we all have to live with. Yes, I stress, eustress, hell, we all stress. So go ahead, create your life. Are You a Depreciating Asset? Depreciation, a term commonly used in business when referring to fixed assets, is defined as “a drop in value”. When we own something like a vehicle or a piece of machinery, as it gets older so the value of the asset goes down. I would like to suggest that each one of us has the same ability to become a depreciating asset. Not only to the company or organizations we work for, but also to ourselves. The good news is, we have a choice and the control to ensure that we don’t “depreciate” in our value but actually “appreciate”. Like a fine wine we can get better and better with age. This aspect relates to the work that we do. Ask yourself the question. What is the value that you bring to your workplace? When last did you do something to improve your knowledge in the work that you do? If we are not constantly increasing our knowledge around our work, not only will we will not maintain the status quo but rather our knowledge will decline as the world around us moves on. Before you know it you will find yourself being replaced by someone who has better knowledge and continues to learn. It is therefore in our own interest to ensure that we set targets for learning and increasing our intellectual capacity. I would suggest that a goal is set for each quarter of the year. Certain areas of the brain have the ability to improve as we get older, so take advantage of this and continue to learn. This learning need not be limited to our jobs but can also include things like, learning a new language or skill. We all lead busy lives. Unfortunately, when the going gets tough the first thing we tend to neglect is our physical form, our bodies. Stress, fast food diets, lack of exercise, these factors all take their toll, and we risk falling prey to the lifestyle diseases e.g. diabetes, heart disease etc. It is critical that part of our “appreciation plan”, is to look after our bodies. Make exercise a regular part of your week. The recommended guidelines are 30 minutes of exercise on most days of the week. This can even be broken down into 3 x 10min sessions if you do not have the time to do 30min in one go. The benefits are too many to list but include stress resilience, reduction in disease risk factors, natural anti-depressant effect, and even brain improvement and growth. Exercise should be top of your list for your “me” maintenance plan. The spiritual aspect of our lives is an extremely personal component. It is here that we find, not only the strength to persevere through tough times, but also our compassion and ability to support others. To be in touch with the spiritual and emotional side of our lives can provide many gifts. Some people find this aspect through religious observance, other through meditation or even music. What ever your choice is, it is important to find that activity or inactivity (in the case of meditation) that provides you with the energy of regeneration and balance. Many of us give more attention and care to our motor vehicles than ourselves. We would not think of letting our vehicle go 1000km past the service date. 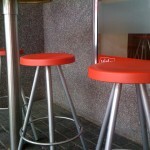 We do this to ensure that the value of the asset is maintained. We should do the same with ourselves, and I suggest this “service plan” is conducted using the 3 checks mentioned above: Intellectual, Physical, and Spiritual/Emotional. By doing this and putting a plan in place we will ensure that our most precious asset not only is maintained, but actually appreciates and grows in value to ourselves and those around us. So be proactive and Create Your life! Go on, admit it! The moment you see a tweet or search results come up saying “10 Secrets of ………” or “5 Secret foods that will …….”, we cant help but click away. We want to know these secrets. We don’t want to be the one who misses out. If there are secrets going around then I damn well want to be in on them. All to often we click on the mysterious link and when we read what the fantastic secrets are, we are left with the thought that it was not such a great secret after all. We can’t help feeling that we have been manipulated into reading these articles. Even if we have had this experience ten times though, we still can’t resist. Just incase there are some real secrets we can’t risk not finding out, and we click away, wasting hours of our time. The reason why people use these tactics to get you to read their articles , buy their products or go to their website to learn their secrets, are far more basic than we ever imagined. It’s not because we really believe that there is some amazing piece of information available. It’s not because we think that the answer to all our problems lie in the secret information you are about to receive. Nope, the reason is far more basic than any of those, and it stems from our childhood. Do you remember the first time someone told you something and asked you to keep it a secret. As a child it burned inside you. You felt you had to let it out and tell someone. It was also a terrible punishment if you knew that anyone of your friends had a secret and would not tell you. It’s our first experience of being excluded in society. Often, the more the information is withheld the greater the value we place on the information. A great example of this is the book going by that awesome title “The Secret”. 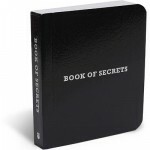 The Secret holds information from over 100 years of thought leadership. Hundreds of thousands of people have purchased this book just so they will not be the ones not knowing this vital information. Yes, unfortunately there is no real mystery or magic, secrets sell. So, you might be asking, how does this little sales secret work? My theory is that it works by tapping into two basic human insecurities. The first being, not knowing something that everyone else does, or to put it simply being left out. A fear taught to us at a very young age in primary or even nursery school. And the second insecurity, a desire to have power, or to have information that no one else does. This plays on the issue of self worth. The next time you feel compelled to click on that “secret” link, pause and think about how you are feeling at that time. What emotional triggers are being pressed and can you avoid the manipulation. Being aware of how and why we fall for this “secret” sales ploy can now assist us in not clicking on that link. I recommend asking yourself the questions, “If this was such a secret, would it be on Twitter?” and “If there was really 10 steps to untold riches, would it only sell for $19.95?” Yes a bit of common sense can save you lots of time. Remember, if it sounds to good to be true it probably is. Lastly, if you are looking for the best secrets online, check out………shhhhh. As it gets towards the end of the year, many corporates move into high gear.Unfortunately it tends to be at about the sametime that most employees are feeling exhausted and burnt out, and just feel like shifting into low gear. The symptoms of stress burnout are both physical and Psychological. Below is a list of both of these characteristics with an indication of how common the particular symptom is. 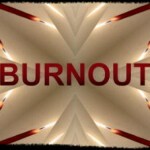 The trouble with burnout is you never know you are in it until it’s too late. Your performance at work starts to decrease. You start having petty arguments with your colleagues over things that would never have bothered you before. At home, you don’t feel like talking with your significant other, never mind getting into bed with them at the end of the day. And the next day, it all starts again. 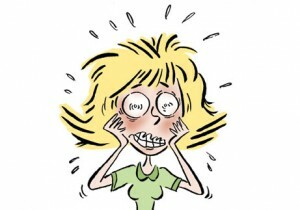 Over 50% of workers say that they feel overwhelming stress during their job (CareerBuilder.com). This overwhelming feeling of stress is a typical sign of burnout and a good indicator that it’s time to examine what is happening in your life and your reaction to situations. When the thought of going into the office fills you with dread, you are experiencing burnout and need to get yourself on a rejuvenation mission to get the real you back in your life and your work. This article provides some tips to identify when you need the break to get your energy back and rejuvenate your mind. The problem stems from our perception. We don’t realize we are in a burnout situation until it’s too late. Stress is a “chicken and the egg” scenario. We think we are stressed at work because we are tired and run down. When the reality could be that we are run down and tired because of the stress at work. One needs to know what the warning signs are so you can stop the downward spiral before it stops you. Source: American Psychological Association study, 2007.
feeling as though you could cry (35%). About half of Americans (48%) report lying awake at night due to stress. Now, if you are anything like me, you have been going through the list ticking off which ones you feel are appropriate. You might even have so many ticked off that you are on the verge of deciding you need to check you your self in for some Psychological R&R. Hold the phone there, as many of the above symptoms are also part of normal stress. You need to take into account the prevalence and severity of your own symptoms. If you have gone through this list and can identify with many of them, I suggest you do the following. Keep a diary of your stress responses, as listed above, for the next two weeks. Each day jot down how many of the symptoms you have and also make a note of what caused the particular feeling e.g. Irritability during staff meeting. Once you have your two weeks worth of data you will be able to get a clearer view on your situation. If you are scoring many of the symptoms on most of your days, I suggest it’s time to take some time out. Plan a week away. If you can’t manage to get the time off for a full week, take two days and have a long weekend. It is important to really switch off during this time to get the full benefit. When you get back to work after the break, do the diary exercise again and see if there is any change. If your scores are still high, there might be something else going on. It could be time to speak to a counselor or psychologist about your feelings at work and what you can do about them. It could also be that you are not happy in your current role and the feelings are an indication that it’s time for a change. Whatever it is, you need to give it some thought and be kind to your self. Take a break and get your energy back before you make any rash decisions. The rejuvenation might be all you needed to put the spark back into your work…and other things. Create your life. In my previous article entitled “Why you do not want to be an entrepreneur”, I focused on some of the aspects one might miss when making the move from a corporate environment to an entrepreneurial lifestyle of starting and owning your own business. As promised there is a very positive flip side to that conversation. In this article, the second in the series, I am going to focus on three positive aspects of being an entrepreneur. I call these “The three C’s of entrepreneurialism”. These are Consuming, Creating and Crafting. I feel that it is these three factors that draw people into becoming an entrepreneur. It’s not about not having a boss. We always have a boss of some kind, or someone to answer to, even if it’s the bank. It’s not about having your own time. When you are not working on the business in the early stages, it is not progressing. It’s not about the money. Most entrepreneurs struggle a great deal to get to the stage of being financially secure and making enough to retire. It is about the three C’s. Consuming, Creating and Crafting. Entrepreneurs are people of passion. They are typically drawn to a business idea like no other individual. The idea hatches in their mind like a small little bird. This little bird grows up very quickly until it consumes the individual so much, that they see no other route other than moving it from an idea to a business. Entrepreneurs will defend their business till the last, putting in all their resources to ensure it’s survival. They can spend hours on end telling you why their business is essential and the best thing since sliced cheese (sliced bread is so passé). The business idea consumes them. Not only their conversations, but also their time and their mind. The entrepreneur is constantly looking for ways to advance the business or areas to promote it. 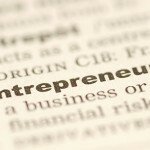 There is no doubt that a true entrepreneur is consumed by the notion of growing their business. The process of starting a business has been compared to giving birth to a child. In the beginning, it needs total attention. You cannot leave it alone for a moment. You need to feed it money. Ensure that it grows. Teach it things so that it matures and grows into a responsible adult that can fend for itself. It is this process of creating that can be so fulfilling for any entrepreneur. A tremendous feeling of satisfaction overcomes one when you look back and see what has grown from something that was once an idea is now a fully functioning business. If you have done things correctly, you are even proud of the systems and the processes in place. You have created something from nothing. You were the artist, and indeed the process is as satisfying as creating a work of art. Very few businesses end up looking exactly like the vision you had of them in the beginning. The crafting process is about making refinements along the way. Taking the advice from what the market is telling you and fine-tuning your offering into the awesome product or service that people are crying out for. We are the crafters in this process like a blacksmith beats a piece of iron into a sword, we mold the business into its evolving form. We also craft the business with our personality. In businesses with co-founders the business is crafted using the inputs and personalities of both of the individuals, in much the same way that a child hold genes from both parents. It’s the ultimate nature – nurture combination, where the idea or concept forms the nature and the individuals nurture it into the final product. The Three C’s of entrepreneurship can be extremely fulfilling. It’s these concepts that draw people in and keep them consumed in their work, creating and crafting as the process continues. If you feel that these are concepts that you identify with, then being an entrepreneur may be the route for you. So be bold, take the leap, and define your future. Create your life. Why You Do Not Want To Be An Entrepreneur. There are so many articles out there telling you to be the master of your own destiny. To stand on your own ship with you hand firmly on the rudder. The media report article after article about successful entrepreneurs, making millions by doing their thing. Living the life. Cars, travel, mansions at the sea, ahhh the life. In this, the first of a series of two articles, I provide a realistic view of what making the break from corporate creature to an entrepreneurial existence is about. Viewing entrepreneurs from the outside, usually leaves many employees drooling at what seems like such an awesome existence. We wonder why we have not made the move. We question our existence, which seems like it is somewhat less of an achievement compared to these daring and brave entrepreneurs who have taken the path less traveled and succeeded. What they don’t focus on are the “failures” or the difficulties on the path. Well, having come from a nice “cozy” (it actually is quite tough) corporate background, and then moving into the entrepreneurial sphere, I wanted to take the opportunity to bring some reality into the equation. Having spent plenty time with other entrepreneurs I can also tell you that my experience is not unique. So firstly lets look at the reality and the things you will miss if you make the move from that nice “cozy” job in a corporate environment to the entrepreneurial business owner world. When you are in a large company, it’s great to be able to call on others for support. Doing a function? Bring in the marketing team. Spread the load and the responsibility. The entrepreneur has to go it alone in the beginning. You need big shoulders for the load and the responsibility. You know all those systems that you moan about having to learn. Invoicing, stock control, HR, payroll…yep you have to have them so happy hunting for the best solution. Again, you are all on your own here. Lets see, pension fund, provident fund, medical aid, paid leave, yup I remember them as a pleasant distant memory. The startup entrepreneur needs to forgo all these pleasures till the business gets going. I remember the thrill of month end when ones bank account would suddenly be resuscitated back to life and all would be well in the world again. As an entrepreneur the business needs to be nurtud and looked after and ones pay check might need to go to the back of the line while the business grows. There is comfort in knowing that there are others who are going through the same experience as you. It may be the joy of closing a big deal or just moaning about the boss, there is comfort in sharing. If you are a single entrepreneur in your business it can be a lonely place. Having a co-founder can be a great help and is highly recommended. Some of the above may seem trivial, but you will be surprised at the small things that one takes for granted. Now, don’t be despondent. There is gold in those mountains, if you are willing to climb them. In my next article, I will cover why you actually do want to be an entrepreneur and all the positives that go with it. There are pro’s and con’s and only you can decide. Create your life.